it's official! the LabVIEW Biomedical Toolkit is released! We are very excited about this new toolkit - it is the result of all several years of hard work by a dedicated team of biomedical enthusiasts here at NI and would not have been possible without all the support we received from you, the LabVIEW community. The tremendous success of the Biomedical Startup Kit on NI Labs gave us the confidence to continue the work on this project and bring it to a level of completeness, performance, and quality that we think will make it a standard tool for LabVIEW users involved in biomedical teaching and research. The new LabVIEW Biomedical Toolkit combines the "executable" and "source code" versions of the previous startup kit and adds so much more. For the executable part, you still could use it for free after installation! The Biomedical Startup Kit is a suite of applications for use in the biomedical field. These applications enable you to apply biomedical solutions using National Instruments software, such as LabVIEW, with National Instruments hardware, such as NI Educational Laboratory Virtual Instrumentation Suite II (NI ELVIS II) and DAQ cards. You can use these applications to perform built-in biomedical applications, such as to acquiring, preprocessing, extracting, and analyzing biosignals and biomedical images. The current version is 3.0. This version includes an executable version and a source code version. For more infomration ( including How-To documents and discussions ) and if you have any feedbacks or suggestion, please visit and post in . Converts files between different file types such as TDMS, LVM, ABF, MIT-BIH Database, MAT, HL7, ACQ, EMG, aECG and EDF. MAT files are written by MATLAB®. Utilizes analog input channels from National Instruments hardware, such as NI ELVIS II or NI data acquisition (DAQ) hardware, to acquire signals. Saves data in a TDMS file. Uses adaptive filters to separate a signal, such as an ECG, from a noisy biosignal. Imports ECG signals from different file types, such as TDMS, LVM, ABF, MIT-BIH Database, MAT, HL7, ACQ, EMG, aECG and EDF. MAT files are written by MATLAB®. Integrates robust extraction algorithms to detect ECG features, such as the QRS Complex, P wave, and T wave. Exports ECG features to a TDMS file. Provides a variety of analysis methods for HRV analysis including time domain, frequency domain, joint time-frequency domain, and nonlinear analysis. 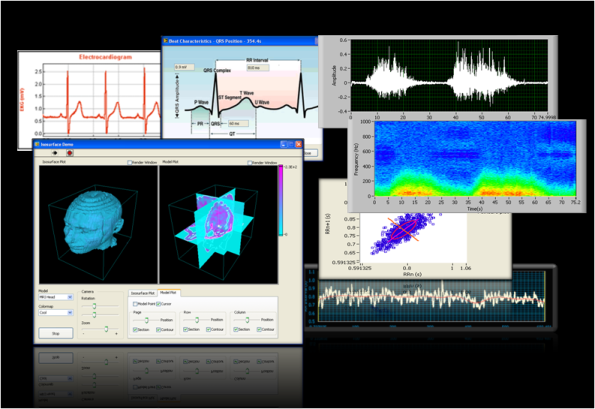 Utilizes analog output channels from National Instruments hardware, such as NI ELVIS II or NI DAQ hardware, to generate a synthetic ECG signal from a recorded file or from synthetic models. Utilizes analog input channels from National Instruments hardware, such as NI ELVIS II or NI DAQ hardware, to control the NIBP device and acquire pressure signals. Provides the functionality of NIBP analysis for research purposes by using the oscillometric method. Reconstructs and visualizes 3D models from 2D 2D medical image slices (supporting BMP, JPG, PNG and DICOM files). You could download the executable version here. Souce code version includes all the souce codes of the above applications and a function palette for biomedical signal acquisiton, analysis and visualization. Note You can download free, 30-day evaluation versions of National Instruments software from ni.com/downloads/evaluation.htm. Note Some virus detection programs interfere with the installer. Disable any automatic virus detection programs before you install. After installation, check your computer for viruses and enable any virus detection programs you disabled. Extract the files from the .zip file you downloaded. Follow the instructions that appear on the screen after launching the installer. Hi i tried to install biomedical_startup_toolkit but its asking for labview 8.6 to be preinstalled.I have labview 2009 on ma PC how can i install biomedical tookit in MA PC using labview 2009.
biomedical_startup_kit.zip in labview 7.1.is down graded version is available. For the zip file attached here, you only need to have LabVIEW 8.6 runtime engine (not the whole LabVIEW 8.6 or LabVIEW 2009). You could download here - http://joule.ni.com/nidu/cds/view/p/id/1101/lang/en. Next time you could also post your feedback on . Go to Biomedical User Group and you could find some. I downloaded the Feature extractor kit but I am not getting the preprocessing options in the software i.e. QRS complex, R-R interval etc. How to calculate ST segment! As function is under construction in this s/w! Can I get a code for it? where can I find the link of startup kit source code version? Hello everyone, Im just trying to install this toolkit , im using labview 2011, but i can't , it says that labview 8.5 is needed, so i dont know what to do .... Can you help me?? This is executable version. You need to install LabVIEW Runtime Engine 8.6 which you could find from ni.com. data acquisitions are differential data acquisition? ?, i mean, i have to connect a reference signal and an original signal and i have to use one analog input for each one, but i have to connect it in a differential configuration or can i use RSE or NRSE configuration? im working with ni pci 6221 so i can measure in a 0 - 0.2 volts range, i want to use this measure range to be able to measure with microvolts accuracy, but in the online biosignal noise reduction data logger i can only use +-5volts range. how i can change the voltage range?, do i need source code version?. i love to work and develop on labview, this is real fun!!! If you want low noise and microvolt accuracy, you need to use differential data acquisition. Single ended results in far more noise. Can't comment on the data logger issue, since I don't know. As DFGray said it would be better to use differential if you can. To change the voltage range to a lower max min range you will need to get at the source code. In the future we may get time to make the logger look at the device you choose and offer appropriate ranges but we have not done that yet. please email [Edit: email removed as it is no longer used for support*] and they will get you some info about how to get that working. I"m currently using labview 2011 . I dowloaded the Biomedical kit from the attachment . But i cant see any vi's from my user libraries.Please clarify me on the same. Please see the the above reply. I am a new user of the NI biomedical startup kit, I have a small pb when installing it, it consists of, when I start the installation, at the step of contacting the notification server, it always tells me that there is no notification server and no tool will be installed, I don't know what does it mean, is it a pb of licence??? because I am using a university one......please I need help. Did you install the LabVIEW 8.6 Runtime Engine? It is a prerequisite. Thanks for putting together a great toolkit. I have ECG data in a .csv format and it looks like the file format converter can import and convert to a .tdms file for further processing. The only problem is that it takes each sample as a second. Is there any way that I can add the sampling frequency in the file so it interprets the data properly? hello？ I can't download this kit , can you tell me the new weblink of this kit? Thank you , please! What's the file specification of GE MARS HOLTER? Using this kit i want to identify the normal and abnormal ECG signal.How can i do that?? Its been almost 2 months that i hav sent an e-mail to [Edit: email removed as it is no longer used for support*] to get the source vode version but no response yet.Can anyone provide the link here. What's your hardware for this transmission? You could ask question in our user group - https://decibel.ni.com/content/groups/biomedical-user-group. hi, can i know which DAQ card can be use for this? is it need to be a PCI type of DAQ card or i can use USB type DAQ? Both USB or PCI will be detected. I am running LV 11 and would like to somehow find a way to download the biomedical startup kit without upgrading to LV 12 and using the biomedical toolkit. Is there anyway to find the download for the biomedical startup kit 3.0? I am also wondering if this kit will allow me to read ECG files from a Del Mar system. 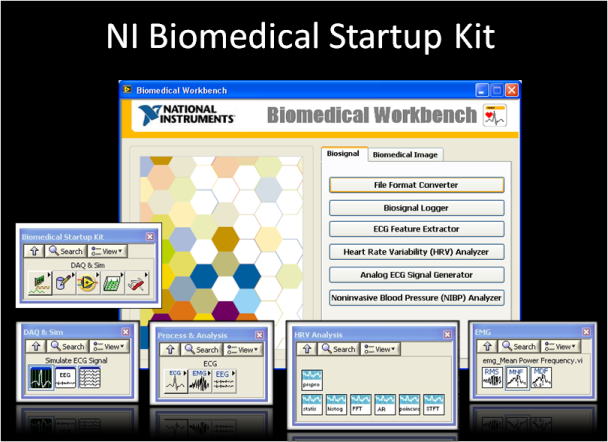 I am a new user of the NI biomedical startup kit, when i install 2014BMTk after extracting i am not able to geting the biomedical application in my pallets it self but it installing as a biomedical workbench and it does not have any contact with my labview.please help me i am trying this from past two weeks.if possible kindly tell me the installaton procedure and i am using LabVIEW 2012. The Biomedical Workbench is standard alone application for acquiring, processing, visualizing biosignals. What do you need? i need to add the biomedical application in my LabVIEW(2012) function pallet.Please tell me howto add the biomedical application in my LabVIEW. Thank u for NI Biomedical group now i able to use Biomedical Application in my pallets it self. I have labview 2013 version installed. I am trying to do a project on ecg monitoring and HRV analysis. What version of Labview Biomedical Toolkit am i supposed to download and from where can i download it? Please directly install the Biomedical Toolkit. It is the formal product. how to you get the function pallets? Please install the Biomedical Toolkit. I was playing with EDF files (EEG) and noticed that LABVIEW freezes when we try to read a large file (Biomedical Toolkit) issue. Do you know a fix? On another note, I have a CSV file that stores time-stamped data from 12 physiological sensors (Tab-delimited) that include, ECG, EMG, SPO2, GSR, Gravity etc. It is not a universal data format. What would be easiest approach to conver this data into a universal data format like EDF? I was wondering if we have some algorithm for SPO2 analysis using two channel data to calculate oxygen saturation. Please include it in the toolkit. I am using MASIMO algorithm which I find not that great for general application. If you have questions, please ask in Biomedical User Group - http://www.ni.com/biomedusers. There are more people who would help. For your first question, if the file is too large, please use a while loop and set a block size for the VI so that it will load the data block by block. There are always a limitation by your PC's memory size.